It’s the All Treats No Tricks Cavalcade of Risk this week! Louise Norris is hosting over at Colorado Health Insurance Insider. You may recall that Louise just hosted Health Wonk Review too, whew – she’s in demand! Louise Norris has posted the falling leaves edition of Health Wonk Review at Colorado Health Insurance Insider. It’s a packed, pre-election edition covering a smorgasboard of topics, from open enrollment and the continuing saga of Obamacare to Ebola and prayer groups. Many thanks to Louise and Jay Norris for hosting. Don’t know about where you are, but here in New England, the “falling leaves” theme hits the mark. After a glorious foliage season, a multi-day deluge is taking its toll on the seasonal color. Driving in the wet, fallen leaves will be precarious today so take care! What’s the verdict on Ebola and workers’ comp? We’ve gathered a roundup of what industry leaders are saying on this topic, as well as broader insurance issues. While Ebola and workers comp claims might be a relatively negligible issue, the larger issue of protecting workers from infectious disease is always one worth considering. Plus, there are other ways that Ebola may impact the business environment in general and business insurance specifically: business travel, supply chain disruptions, business interruptions, liability, malpractice and new coverage options, to name a few considerations. Workers at highest risk would be health care and humanitarian workers in the countries most directly affected, Here in the U.S., hospital staff, public health personnel, humanitarian workers and first responders would be on the front lines for any additional outbreaks. Other workers with potential exposure might include waste disposal workers, cleaning staff, morticians, laboratory researchers and scientists, airline workers and business travelers. Before we look at some of the insurance and prevention considerations, a little perspective from Vox by way of a brief and compelling video. Christopher J. Boggs of Insurance Journal takes a nuts & bolts look at the two-part litmus test of compensability under workers comp and how Ebola claims would stack up in Is Ebola Compensable Under Workers’ Compensation? Dave DePaolo looks at Ebola & Work Comp and expresses concern about our capacity to handle an outbreak, noting that “If ever there was a situation where there should be no distinction between workers’ compensation medical treatment and general health, the current Ebola situation is it. Delivery of medical care in workers’ compensation is just fine for broken bones, even for something like black lung disease. MARSH offers an overview of Six Types of Insurance Coverage That May Apply to Ebola, with workers’ comp at the top of the list. Dr. Steven N. Weisbart, CLU discusses the insurance industry ramifications of the spread of the Ebola virus, from life/health implications to property/casualty in Insurance Information Institute: Facts and Perspectives on the Ebola Pandemic . Melissa Hillebrand of PropertyCasualty360 offers a list of what you may not know ib 30 Ebola facts that will make you cringe, plus 7 ways to manage the risk. She covers how how the Ebola virus impacts economies and supply chains, insurance issues including evacuation, exposures and policy exclusions, and what you and your companies can do to prevent and control Ebola risk. Arthur D. Postal of Property Casualty 360 looks at what Ebola will mean for the P&C industry over the long term. Joe Palazzola of the Wall St Journal Lawblog explains why Ebola suits against Texas Hospital likely wouldn’t be easy to win. CDC: Health care workers: Could it be Ebola? Russell Hutchinson has posted the 219th edition of Cavalcade of Risk at moneyblog. Catch up on various risk-related issues, including reports from New Zealand. Russell is our ongoing global correspondent! Early this week, Oregon’s Department of Consumer and Business Services published its biannual rankings of state workers’ comp costs (by the way, did you know that “biannual” means both twice a year and once every two years? English is a funny language). Kudos to Jay Dotter and Mike Manley for once again separating the wheat from the chaff. Since 2006, we’ve written about Oregon’s rankings, as well as those of the actuarial consulting firm, Actuarial & Technical Solutions (ATS) and the National Foundation for Unemployment Compensation and Workers’ Compensation (UWC) headquartered in Washington, DC. If you’re so inclined, see our in depth 2006 report, our 2009 report highlighting Massachusetts and our 2010 report. Following the Oregon release the blogosphere was quick to note that California, leapfrogging Connecticut and Alaska, had won the 2014 gold medal for most costly state in the nation. People, this was not a surprise. 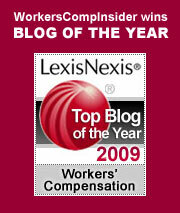 We have been watching the Golden State’s periodic workers’ comp train wrecks since the late 1980s. Here’s how things usually go. This has happened at least three times in the last 20 years, most notably during the administration of the Terminator, Arnold Schwarzenegger, when annual costs exceeded $29 billion dollars (you read that right). After reform, costs dropped to around $14 billion. Everyone declared victory and left the field until the sky fell again. Alex Swedlow and the California Workers’ Compensation Institute have done a marvelous job tracking costs and, through solid research, shining a light on possible ways to lower costs going forward. Nonetheless, to say that California’s workers’ compensation costs are continually volatile seems indisputable. 3. And, you might ask, what about the sixth New England state, the Commonwealth of Massachusetts, the home of the bean and the cod. Well, it may be the proverbial broken record, but I’m proud to note that Massachusetts, our home state, at 48th most costly, holds the distinction (again) of being the least costly of any major manufacturing state. This has been the case for the last 15 years. Why other New England states, for that matter all other high cost states, don ‘t take a leaf from the Massachusetts book is beyond me. I’m betting that California, the state, which, if it were a country would have the fifth highest GDP in the world, will continue its up and down roller coaster ride as time marches on. It’s just too big with too many highly entrenched vested interests to do otherwise. While at Joe’s blog, also check out his post on drug formularies . He makes the case that despite progress that payers and PBMs have made in curbing runaway opioid costs, new drug-related issues keep emerging (eg compounding) and tighter controls are needed. David Williams hosts this weeks Cavalcade of Risk #218 at Health Business Blog – check it out!